Charlie Speziale, a friend of Armstrong medic, Eric Layton, is participating in a mission trip to the Dominican Republic with International Nursing Incorporated, (INI). INI will be bringing medical services to extremely rural areas where men, women and children are in dire need of basic care. 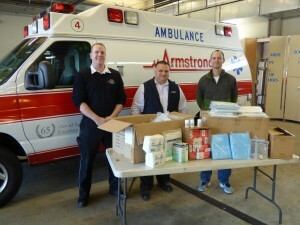 As each clinician traveling is responsible for providing supplies, we were more than happy to assist with a donation of items. We wish all of the INI members a safe and impacting trip and applaud their selflessness and dedication. Pictured are Armstrong’s Support Services Manager, Phil Reid, Director of Logistics and Planning, Jeff Scafidi and Charlie Speziale of INI.